For over a year, Ceres’ bright spots have dazzled astronomers and the space-loving public alike. The glimmers became a little less mysterious in December, when we learned that they’re essentially giant piles of salt. But now, ground-based observations are adding another fascinating wrinkle to the story. That’s according to Paulo Molaro of the INAF–Trieste Astronomical Observatory, who spent several nights last summer measuring the light bouncing off Ceres’ brightest bright spots—those located in the infamous Occator Crater—with the European Southern Observatory’s 3.6-metre telescope. What he found is rather amazing: The spots brighten and fade over the course of a day, like a lightbulb on a dimmer switch. This observation, detailed today in the Monthly Notices of the Royal Astronomical Society, corroborates prior observations of transient haze over Occator crater. What’s more, it’s sure to stoke excitement about geologic activity on Ceres, a tiny, asteroid belt-bound world whose complexity has already exceeded our wildest expectations. Once a relatively obscure astronomical object, Ceres became a household name last spring, when NASA’s Dawn spacecraft entered its first distant orbit around the dwarf planet. As Dawn spiraled ever closer to Ceres over the past year, it captured troves of hi-res imagery, allowing planetary scientists to construct stunning geologic maps of the entire surface. These maps not only include mountains, chasms, and craters galore, but over 130 gleaming bright spots. For months, astronomers suspected that the bright spots were made of water ice. But a spectral analysis published in Nature last fall came to a different conclusion. The spots are, in fact, made primarily of magnesium sulfate salt. And their occurrence in craters across the Ceres’ surface hints at a likely origin: a subterranean brine layer, one that spans the entire planet and gets excavated during impacts. The depth of that subsurface layer, and whether it’s sustained by geologic activity today, is not yet known. But the latest discoveries should motivate scientists to keep searching for answers. Using the HARPS spectrograph at the ESO’s Southern Observatory, Molaro was able to tease out unexpected changes in the brightness of spots in Occator crater. Not only does the illumination of the bright spots change as Ceres rotates, the spots brighten during the day in an unexpected, and somewhat variable, manner. The most likely explanation, Molaro says, is that volatile substances within the bright spots are sublimating under the Sun’s piercing rays, producing an ephemeral haze that scatters solar radiation and leads to additional daytime brightening. At night, the haze clouds evaporate, and the spots grow dimmer. Serendipitously, this hypothesis seems to confirm direct observations of haze clouds over both Occator and Oxo craters made by the Dawn spacecraft. From dazzling craters to afternoon haze, Ceres is revealing an alien beauty we never could have imagined. But moreover, the bright spots are a clue that the largest object in the asteroid belt might be geologically active. As Molaro explains, systems that are continually leaking material must also be supplied material from somewhere. “This implies a leakage from the interior and therefore a source of internal heating, which is not easy to find for an isolated body,” he told Gizmodo. These are our first clues—much more work will be needed to confirm that Ceres is an active world. But if that turns out to be the case, we’re left with another mystery of cosmic proportions: how? We’ll have to be patient as scientists work out the answers. 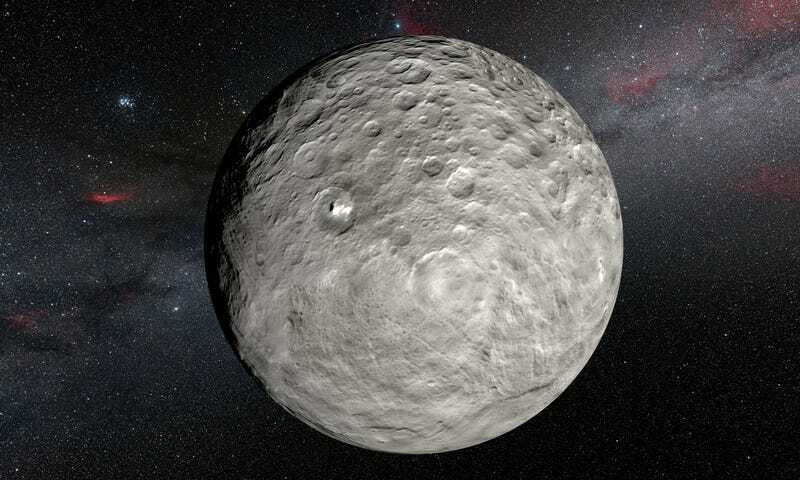 For now, Ceres continues to defy expectations, proving that dwarf planets—small as they are—can have larger-than-life personalities.